Is the surgeon accredited in the UK? Will you get the chance to have a consultation with the surgeon before the day of surgery? Will you know for sure which surgeon will perform the operation on the day? Does the surgeon perform at least 1,000 vision procedures per year? Is the surgeon able and available to manage any complications, in the unfortunate event that there is a post-op problem? 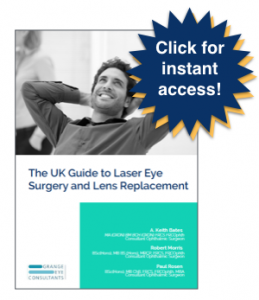 Is femtosecond laser technology available? Does the clinic provide a variety of refractive procedures, corneal and intra-ocular, to enable you to get the right vision correction for your eyes? Did the clinic take time to explain to you the long-term effect of presbyopia on your vision? Will your surgery take place in a private hospital with nursing and medical support?